France, 2007, 94 minutes, Colour. Freddie Highmore, Mia Farrow, Ron Crawford, Penny Balfour, Doug Rand, Adam Le Fevre. Voices of: Madonna, Snoop Dogg, David Bowie, David Suchet, Ezra Knight, Jimmy Fallon, Emelio Estevez, Robert De Niro, Harvey Keitel, Rob Corddry, Jason Bateman. This is the first film in a series of three recounting the adventures of a young boy, Arthur, his being looked after by his grandmother after his grandfather had disappeared and his parents are looking for work. The main difficulty is that unless repayments are made on the house, the lawyers will come and reclaim it. 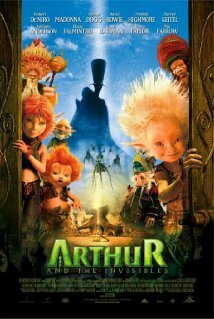 This part of the drama is live action, and then the film then goes into animation, the creation of a little world, the world of the Minnoys, with Arthur becoming one of them. They are miniscule people, only a millimetre or two tall. The film it is designed for younger children, there is quite an amount of delight in the world of the Minnoys as well as the range of characters found there. And, in this film, but not so much in the next film is, the voice cast for the English dubbing is exceptional. It includes Madonna as the voice of the Princess Selenia (to be taken on by Selena Gomez in the sequels), with the evil wizard Maltazard voiced by David Bowie (Lou Reed in the sequels). Robert De Niro is King and there are some amusing characters voiced by Jimmy Fallon and Jason Bateman. The kingdom of the Minnoys is in the house garden, where the grandfather had relocated them and they are indebted to him and the family. There are also Massai tribesmen. In the land of the Minnoys is a cache of Ruby’s and, if Arthur is able to retrieve some of them, it is possible that the debt will be paid and all will be saved. The young audience, both boys and girls, will identify with Arthur, in the live action in the form a Freddie Highmore, familiar from such child roles as in Charlie and the Chocolate Factory, The Spiderwick Chronicles… And who in his early adulthood turned into Norman Bates for the television series, Bates Motel. Mia Farrow is her usual somewhat her fey self as the grandmother. An imaginative adventure for children, with some contemporary adult relevance in terms of houses being reclaimed, that proved popular. Surprisingly, it has been co-written and directed by Luc Besson, who made some classics early in his career like Subway and The Big Blue, La Femme Nikita, Leon, as well as The Messenger about Joan of Arc. But his career was very much involved in writing, producing and direction a great deal of action shows – in the vein of the Transporter series, Taxi and Taken series.